Hey Elmo - Liked that picture of the omelette - if I had a fork and knife I mighta' started cutting up the CRT! I enjoyed the fact that both you and Mealcentric have done recent posts. Makes the different, but similiar, very interesting! I know how much you adored Lotus of Siam in Vegas, so I am inquiring about some more input as to why Zesty Thai's Pad See Ew was better than LoS' version. 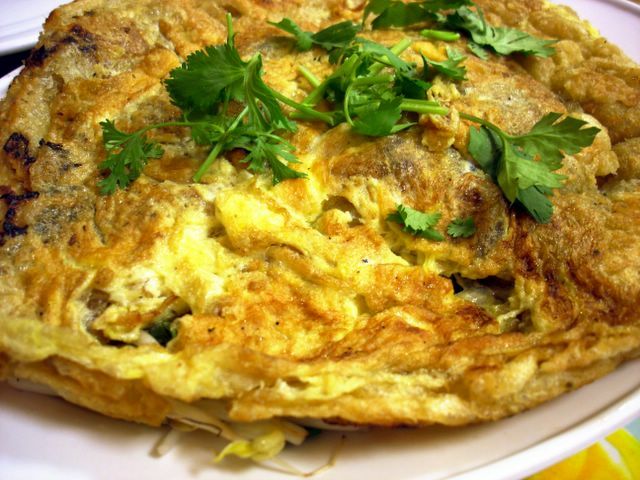 I thought it was funny that it was dishes made with egg that both Mealcentric and I liked best at Bangkok Taste. I found Zesty Thai's Pad See Ew to have everything that I love about the dish, which is mainly "wok-hey", that smoky flavor that comes from a hot, well-seasoned wok. Added to that Zesty Thai's version is very bold and assertive. The seasonings and soy penerate so deeply into each noodle strand that it registers and excite every taste receptacle on my palate when I eat it. The noodles are also dry, no gravy or "wetness" at all, so it's almost like the Chinese Chow Fun (that stir fry), but without the grease. I think Zesty Thai truly has Pad See Ew (and also Pad Kee Mow) down pat. LoS's version, if I recall, was more subtle. It had a good flavor and I liked it, but the noodles hadn't soaked up all of the flavors of the soy, garlic, etc. The color of the noodles were paler in comparison as a result. Although some may like this style (which seems to be the way it is made at most Thai places I go to), I prefer Zesty Thai's version. Thanks for the rec! And I'd be interested to know what you think of both. 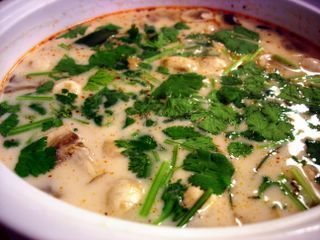 Being new to town, I am interested to hear what other Thai recs you have. Also, what do you think about Thai Bros. in Laguna? Welcome to the neighborhood, and thanks for visiting my blog. There are Thai places scattered around Orange County. Some of the most notable ones are Thai Nakorn in Garden Grove and Renu Nakorn in Norwalk (not really O.C., but close). In Irvine and Tustin, the ones I've tried are Thai Spice (a take-out joint with okay food), Thai Kitchen (decent but very Americanized), and Thai Specialty 2 (so-so, but expensive). There's also one or two more I haven't tried, and one of them being Thai Bros. Where is that one BTW? Zesty Thai, which I mention a lot in this post is only open during lunch and most of their steam table offerings aren't good. But their pad see ew, is the best I've had thus far. I'm glad to see that others have discovered Bangkok Taste restaurant. It is a great little and very clean. Bangkok Taste is probably the best Thai around, The red curry dishes are fantastic, I like the red with bamboo shoots...it is hard to get through the menu at this place because you have had a particular dish that is soooo good it becomes difficult to change, even though all the other dishes are as great. this is truly a diamond find for the palate.oh and a must have is the Thai Ice Tea...wow! Tried it last week. Liked it too. THANKS for commenting. AND CEE! Thanks for the recipe. But the link doesn't work! Does the link work now? I'm not sure why it was not working. Let me know if you can't get it! It works now! Looks like an awesome recipe. Thanks! 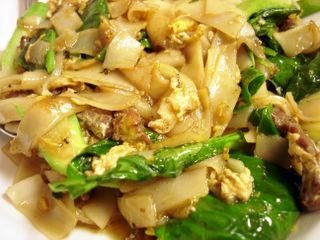 I am also a pad see ew aficionado... if you ever find yourself in Brooklyn, you must go to Amarin Cafe in Greenpoint. I have tried pad see ew in just about every other Thai joint in NYC, and none of them compare. Its almost worth flying out from LA. Okay, maybe theres a quite a few reasons to fly out from LA to NYC. Okay I stumbled onto your blog for the first time today, and I have to say I have been enjoying reading it, but honestly! I eat occasionally at Bangkok Taste because it's near my job, but it is way down the list of what I consider to be good Thai restaurants. The last time I ate there the food was actually pretty awful. You can definitely do better.